This was my first opportunity to image the Moon through my ETX125 telescope using my DMK31 B&W camera. This camera has a 1024x768 pixel chip. Each image was produced by stacking the best 100 frames from 900 frame movie files using Registax6, then using wavelets to sharpen each stacked image. Photoshop was used for final adjustment and sharpening. The link to a full sized zoomable mosaic of the five images collected on this night can be found at the bottom of this page. 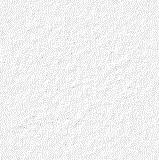 Move your mouse over the image to identify the feautures. This image is dominated by the very young crater (in lunar terms) Tycho. Tycho is 102km in diameter with a very predominant central peak. The white streaks across the images are material which was ejected during the impact which formed Tycho. 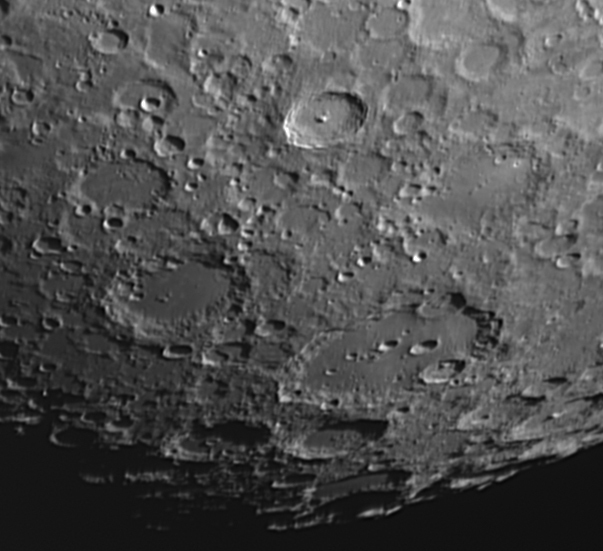 The large crater between Tycho and the Moon's limb is the 245km diameter, Clavius. This is a much older crater than Tycho as it has been peppered by later impacts, some as small as just 10km in diameter. The walls of this crater show obvious signs of slumping and landslides. The smooth-floored crater to the left of Clavius is the 157km diameter Longomontanus. Move your mouse over the image to identify the features. Bullialdus is 61km in diameter and 3.5km deep with a flat floor and a clump of central peaks. 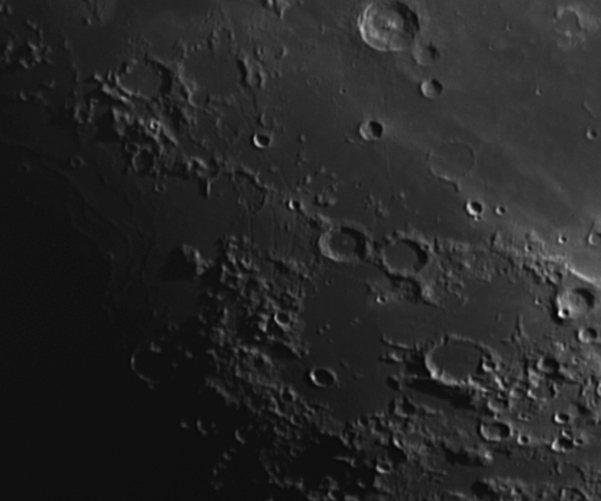 Mare Humorum is just emerging from lunar darkness and shows some interesting features. 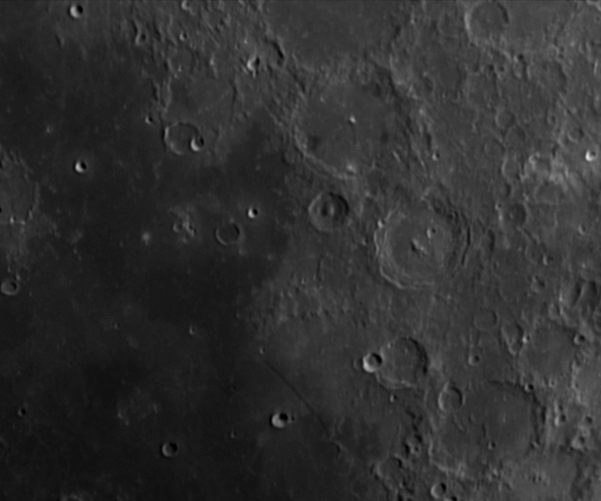 The crater Hippalus has a large part of its rim missing. This is due to to the huge weight of the lavas which flooded the mare basin causing its rim to tilt inwards. This tilting crumpled up the lava flows in the interior to produce the wrinkle ridges which are obvious near the terminator. This compression resulted in tension in other parts of the crust producing a series of concentric cracks in the lunar surface known as the Rimae Hippalus. The innermost of these curving rilles, each about 3km wide, runs through Hippalus and extends at least a diameter of the crater to the north and south. The outermost rille extends the furthest to the north. Palus Epidemiarum is a small lava-flooded basin with the 60km diameter crater Capuanus its largest feature. The three large craters to the west of the basin are lit almost too vertically to bring out many of their features but central peaks and slumped crater walls can be seen clearly. The Straight Wall, the best example of a fault on the Moon, casts a shadow 120km long but the fault itself is no more than 450 metres high. The fault is not as it appears, a sheer cliff but is a fairly steep slope rising from the plain at about 20 degrees. That is steeper than 1 in 4, try cycling up it! At the top mid left of the image is an indistinct crater with a faint curving light line running across it. This is the crater Davy and the faint line is a chain of craters. These craters can be seen more clearly if you move your mouse over the image to show a magnified inset of Davy. The craters were probably formed after a comet or small asteroid passed so close to the Earth that it was torn apart by Earth's gravity producing a line of projectiles which smashed into the Moon in quick succession. This is very similar to what happened when comet Shoemaker-Levy 9 smashed into Jupiter in 1992. The above three images are from a series of five which I collected on the same night. The five images were stitched together to produce a mosaic using Microsoft ICE. A full sized version of the mosaic, where you can move around the image and zoom in and out can be found by clicking here.